The Allen Theatre’s April 1, 1921 opening night attracted more patrons than its 3,080 seat capacity that scores of disappointed filmgoers had to be turned away. Originally built as an opulent silent movie house, the Allen required no backstage facilities (dressing rooms, storage, etc.). To later accommodate legitimate theater presentations, it was necessary to build a “stage house” onto the venue during restoration in preparation for its reopening October 3, 1998, when it began to host long-running, touring Broadway productions and concerts. The Cleveland Ballet’s move to San Jose made the KeyBank State Theatre available for Broadway, and use of the Allen decreased, paving the way for PlayhouseSquare to invite new resident companies to the district. Playhouse Square President and CEO Art J. Falco began discussions with Cleveland State University and Cleveland Play House about moving their productions to the Allen Theatre. 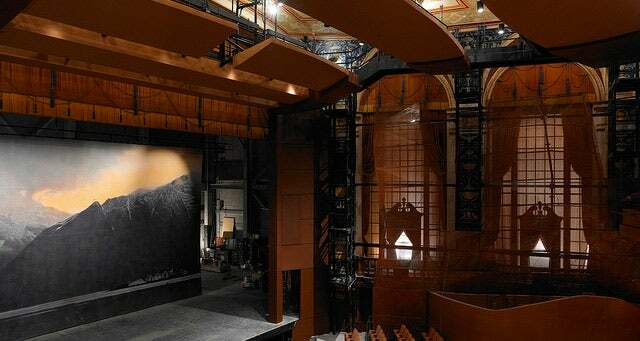 In August of 2010, the Allen was closed to undergo a dramatic reconfiguration from an historic theater with 2,500 seats to an intimate, 500-seat contemporary theater nestled in historic environs. The transformed Allen Theatre reopened in September of 2011. Two new theaters, the flexible 300-seat Outcalt Theatre and the 150-seat Helen Rosenfeld Lewis Bialosky Lab Theatre, opened 2012 to complete the Allen Theatre Complex, shared by Playhouse Square, Cleveland Play House, Cleveland State University’s Department of Theatre and Dance and Case Western Reserve University’s MFA Acting Program.